The iPad Pro will launch on November 11th, according to a new report from 9to5Mac. Upon unveiling the 12.9-inch iPad in September, Apple said the Pro — its largest and most powerful tablet yet — would go on sale in November, but didn't specify an exact date. 9to5Mac also reports that the Apple Pencil and Smart Keyboard will be released on the same day. The iPad Pro offers nearly twice the CPU and graphics performance of iPad Air 2 and an improved multitouch display that works with the Pencil accessory for more precise and sensitive drawing capabilities. It also features four speakers, a first for iPad, and supports iOS 9 features like side-by-side app multitasking. But with a larger size comes a bigger price; the Pro is Apple's most expensive iPad ever, starting at $799 for a 32GB Wi-Fi model and running all the way up to $1079 for a 128GB version with LTE built in. The Smart Keyboard costs an additional $169, and the Pencil will sell for $99. 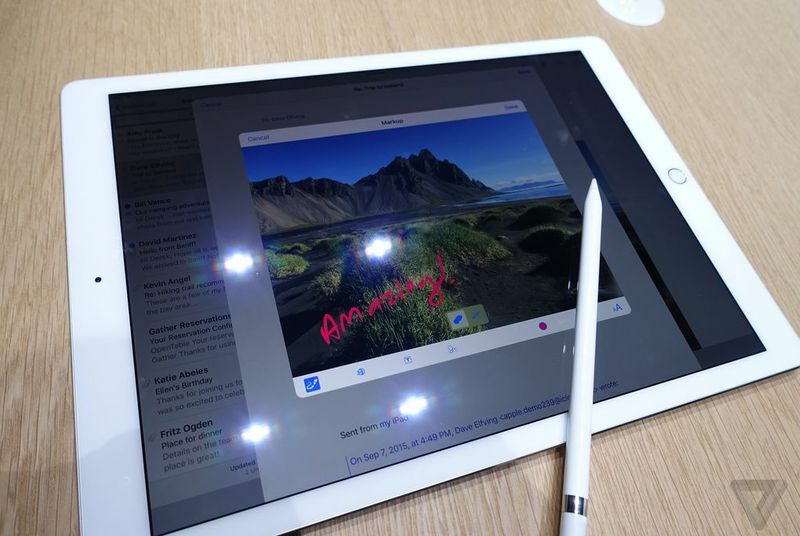 iPad Pro will launch both in-store and online on the November 11th date, per 9to5Mac's report.